Do you frequently take your pup on car rides? If you do, you might want to consider purchasing a special kind of kennel that will keep your pooch safe while he’s in the vehicle. A comfortable, reliable, and a secure pet carrier for travel will give your dog a cozy place for resting and you won’t have to worry about his safety in case of an accident. When it comes to travel crates for dogs, there are a lot of different types – some are made out of mesh, some made of plastic, while some sport a heavy-duty metal construction. As you can already guess, this makes figuring out which one is the best for your needs quite challenging. Have no worries, though – we’re here to carefully analyze the best car kennels for dogs. 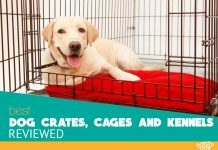 We’ll take a closer look at the currently most popular crash tested dog crates and find out everything about their advantages and value for the money. Let’s go! We created a detailed guide about the ultimate cages for dogs so make sure to check it out if you want to know more about different types and uses. The first product we’re going to take a look at comes for Gunner Kennels, which is one of the most famous US manufacturers of these types of pet products. The majority of the popular products are designed to house smaller breeds, but not this one – the Gunner Kennels G1 can contain canines that weight up to 75lb, making it a suitable choice for the owners of large breeds. Let’s take a closer look at it! 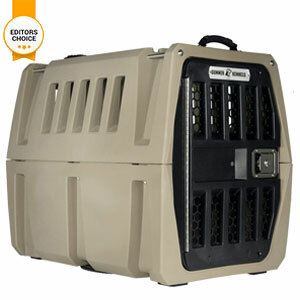 The Gunner Kennels G1 is a heavy-duty model – its walls were manufactured from solid double-walled plastic, which was combined with stainless steel tie downs and a wide base. As you can see from the picture; this model was designed to be sturdy and to easily withstand daily wear and tear, as well as the damage that happens during a possible collision. How strong is this kennel, actually? The manufacturer says that the roto-molded plastic that was used for its manufacture can survive a 200-foot fall and a shot from a 12-gauge shotgun. The model was also tested with forces up to 4000 pounds and it didn’t crack – if this isn’t impressive, we don’t know what is. However, the most important thing here is that G1 has received a 5-star rating from the Center for Pet Safety (CPS), which gives an almost absolute peace of mind when it comes to safety. The fact that G1 was designed primarily with the travel safety in mind means that it doesn’t have a lot of extra features. Its interior is very easy to keep clean, though – there’s a drainage hole in case your canine friend has an “accident”. The model’s windows provide sufficient ventilation, so you won’t have to worry about your pet experiencing a heat stroke during the long car rides in the summer. In case your four-legged friend is a determined escape artist, you’ll be grateful to find an escape-proof door on G1. It has a key-locked paddle latch and it was made from reinforced aluminum. The only major downside of this kennel is its price – if you’re on a tight budget, you’ll have to look elsewhere. All in all, we can easily see why is G1 one of the most popular safest dog crate for the car on the market. It’s a spacious, CPS-certified model that guarantees safety for your large dog during long rides in an automobile. Next up is Sleepypod Mobile, a model that’s more than just a carrier – lined with ultra-plush foam, it’s almost like a luxury traveling bed for your furry companion. In case your pooch is heavier than 8 pounds but lighter than 15 pounds, this just might your best choice. Just like many other traveling cages for dogs we’ve reviewed, Sleepypod Mobile has also been crash-tested and bears the much-needed CPS certification. One of the reasons because of which the model passed the tests is that it was manufactured from luggage-grade nylon, which easily withstands collision forces (unlike the inexpensive alternatives). This means that Sleepypod Mobile provides excellent protection in case of a car accident, which is the vital thing when it comes to dog carriers optimized for car travel. However, the outstanding safety rating isn’t the only great thing about this kennel. Its domed design provides ample space for your canine companion, while the plush interior offers a sufficient amount of comfort for the long car rides. The insides of Sleepypod Mobile are covered with soft polyester, which is among the better materials when it comes to interior comfort. Furthermore, the model also provides good ventilation due to its mesh dome. There’s a top handle on this dome, which doubles as a sturdy seat belt attachment and presents an additional safety feature. Another thing worth mentioning here is the fact that the dome can be opened when you’re not traveling – all you have to do is undo the zipper. The full name of this carrier is Sleepypod Mobile Pet Bed, and the “bed” in this name means that the model features internal bedding that’s combined with a waterproof foam liner. Just as we expected, the bedding is washable – it’s something that the owners of the messier canines will certainly appreciate. When it comes to disadvantages, we should mention that this one is not certified for air travel. It’s a great choice when it comes to car rides, but it bears no IATA certification and cannot be carried into an airplane cabin. The fact that this product can’t be used on airlines isn’t a major drawback – you are, after all, looking for a model that you’ll use in your car. And Sleepypod Mobile is a fantastic choice for that matter and an investment that you won’t regret. When it comes to soft-sided pet car carriers, Petego Jet Set is the real deal – this model provides unparalleled in-car safety due to its design that adds durability and structural integrity. It’s a safe, stylish, and a reasonably priced product that deserves a more in-depth look. Like all other carriers manufactured by Petego, this one also sports a stylish design that immediately catches attention. The Jet Set carrier is available in several different color combinations – silver/brown, orange/brown, and green/brown, as well as in two plain colors – black and beige. As far as we’re concerned, all versions look very attractive and present a chic way to transport your four-legged companion in the car. It’s not called “Jet Set” without a reason! However, the sleek design isn’t as important as its safety, although Jet Set delivers that too. One of its main selling points is the manufacturer’s signature Forma Frame, which is capable of transforming this carrier into a solid structure that efficiently protects your pup in case of a car accident. Another great thing about this metal support system is that it’s collapsible – one can easily fold down this carrier when it’s not needed and store it away under the bed or in the closet. Another feature that sets Jet Set apart from the competition is its unique ISOFIX latch connection. It’s a system that helped this crate pass the CPS crash study, as it provides great security and allows Petego Jet Set to safely contain the pooch during the collision. One particularly impressive thing about this innovative latch connection is that it snaps into place just like your regular safety seat belt. A hassle-free operation is always a big plus in our book! The model can be carried as a backpack, over the shoulder, by hand, or fixed to the car seat. The manufacturer also provides an array of travel accessories for this crate, which can be purchased separately on their website. Our only complaint is the size of its mesh windows, as they’re quite small and make the interior very dark. The Petego Jet Set is, without a doubt, one of the safest and best-looking soft carriers out there. Those looking for a mesh-made carrier that will keep their canine companion safe inside the vehicle should definitely consider this model for purchase. With the dimensions of 18″ x 11″ x 11″ and the weight of just 4.6 pounds, the Gen7 Commuter is quite compact and doesn’t take too much space. It can contain canines up to 20 pounds, although the manufacturer advises that it’s best suited for dogs that weight no more than 16lbs. This makes it an ideal choice for the owners of smaller breeds, such as Yorkshire Terrier, Maltese, Pomeranian, Affenpinscher, and others. The design of this cage is a simple one, although it still looks quite attractive. It can be bought in two different colors – black and burgundy, with each of them having five mesh windows that provide good airflow and sufficient ventilation during the long summer rides. Due to the presence of a convenient shoulder strap, carrying the Commuter is exceptionally easy, and the strap can also be wrapped around the back seat’s headrest for better stability. Even though this is a soft-sided model, we still have to give praise to its sturdy structure. It was manufactured from ballistic nylon and features industrial-grade stitching, which is quite impressive when it comes to these types of pet products. For additional safety, Gen7 decided to equip this carrier with a heavy-duty seatbelt latch which allows the owner to utilize his vehicle’s seatbelt mechanism. With the crate latched to a seatbelt and with its shoulder strap wrapped around the headrest, there’s no space for worrying about your dog getting hurt. Besides its 5-star CPS certification, the model is also airline approved (by most major airlines, though – don’t forget to check the specific requirements of your airline). The only disadvantage is that it has no storage pockets, which means that you’ll keep your pet’s water bottles and treats in the bag. The Gen7 Commuter provides security and comfort while on the go, as it has a couple of excellent safety features and a cozy, well-ventilated interior that makes every car ride a joyful experience for the dog. We recommend it! This pet crate seems to be one of the safest products for car travel on the market, especially when it comes to medium and large dogs. Made from heavy-duty steel and being virtually indestructible, it’s the perfect choice for the safety-conscious pet owners. This model is unlike any other on the market – it has been manufactured from ASTM A366 gauge steel which is unmatched in terms of protection and durability. It was built to last, and will probably last you for years, even decades. The depth of this model is fully adjustable, allowing you to keep it even if you decide to change cars. Although it bears no CPS certification, the 4×4 North America is probably among the safest travel dog kennel that money can buy. It is the only crash-tested certified model that uses governmental safety standards, such as SPCT, ECE R-44, ECE R-17, and ISO 27955. This means that it was crash-tested for the rear, front, and roll-over protection, and it bears an excellent decade-long safety track record. If there was ever a kennel that gives complete peace of mind when it comes to security, it’s this one! Even though it’s quite bulky, assembling this model is exceptionally easy and can be done in 10 minutes. It comes with individual panels, telescopic tubes, all necessary hardware, and detailed instructions that are filled with pictures which make the whole process very straightforward. One thing we particularly like about it is that its doors feature gas hydraulic motion springs, which make opening and closing them exceptionally easy. The same can be said for the model’s tie-down straps, which allow the owner to secure this kennel to the anchor points in the vehicle. We also like the presence of an escape hatch – its purpose is to help you safely remove the pooch from the cage in case of a collision. The only major downside of this incredible kennel is its high price. No matter which size of it you decide to purchase, you’ll have to spend a lot of money – unmatched safety comes at a high price. The high price of this dog travel kennel is easily justified by the sheer number of its impressive safety features. With this model, you won’t have to worry about your pup getting hurt in an accident – 4×4 North America prevents injuries with 100% efficiency. Why Dogs Need to be Secured in the Car? Whether you have decided to purchase a quality dog travel kennel or have opted for another kind of dog car restraint system, your canine friend has to be secured while he’s in the vehicle (or while you are cycling with him). Many owners decide to give their dogs with free movement in the automobile, although this can have very dangerous consequences for both the owner and his pet. A sudden collision can cause your pooch to become an instant projectile – he could fly through the windshield and hurt you and other passengers in the process. Furthermore, unrestrained dogs are one of the most common causes of distracted driving. You’ve probably heard about Stephen King’s near-fatal car accident – he almost died when the driver tried to correct his disobedient dog and took his eyes off the road to do so. Even though it can be fun to have your furry companion as a copilot, don’t ever forget that distraction can lead to fatal consequences. In simple words, it’s just not worth the risk. Where to Put the Crate? Majority of dog owners place their pet’s crate in the back of the vehicle. However, this often isn’t the safest place for your pup to be at. In many vehicles, particular back and front sections are manufactured as designated “crumple” areas in case of a collision. In simple terms, these zones are meant to crumple in case of an impact so that the passengers inside the vehicle may be preserved. It’s a life-saving technology, but only as long as there’s nothing placed in these “crumple” zones. The positions of these zones vary from one model of a car to another, especially when it comes to bigger vehicles that utilize a lot more of the backspace for seating. For that matter, we advise consulting with the car dealership so that you can determine the positions of the crumple areas in your automobile. It’s the only way to make sure that your pet’s kennel is away from any danger. Placing the pooch on the front seat, on the other hand, isn’t a good idea either. It exposes the pup to front-passenger airbags, and these things were designed for humans – not for canines. Just like you wouldn’t want to place your kid in the passenger seat because he or she is too small to be hit by an airbag, you wouldn’t want to do the same thing with your furry friend. Even though safety is important for canines of all sizes, bigger dogs need to be given some special care. Their larger bodes can turn them into larger projectiles, thus making them far more dangerous than the smaller dogs. Moreover, larger canines experience far more force on impact. For that matter, you need to pay special attention when securing your large pooch – make sure that he’s placed at an appropriate place inside the vehicle and that his crate is stable and doesn’t move while you’re driving. You don’t want to regret your hurry later! How to Choose a Car Crate? When choosing a regular kind of a dog kennel, comfort is the primary concern. However, buying a special car kennel brings several other factors into play, with the safety being the most important of them. In this article, we’ll show you a couple of considerations you need to have in mind while looking for a quality car carrier for your four-legged friend. Unlike with the standard pet kennels, choosing a model that’s too large can have quite dangerous consequences. This is due to the fact that an excessive amount of empty space around your pooch means that he can be “thrown” in case of a collision. For that matter, we advise you to look for models that are not too spacious but still allow your furry companion to lie down and sleep during the ride. When it comes to material, one of the most important things you need to keep in mind is to avoid wire models. Even though the wire cages are great for indoor use (since they provide plenty of ventilation); they’re not exactly suitable for vehicles, as they are not strong enough to withstand the forces that occur during the collision. Similarly, soft-sided models are also to be avoided, although we have to mention that there are a couple of exceptions (especially when it comes to smaller breeds). All soft-sided cages that we reviewed above are safe and CPS certified and buying one of them can’t really turn out to be a mistake. Every dog travel cage has been manufactured for canines up to particular weight. In case your pooch weighs more, the kennel probably won’t be capable of providing him with a sufficient amount of safety. Before buying a certain model, make sure you know the exact weight of your pup as well as the maximum allowance of the carrier. This one is a no-brainer – your dog’s travel carrier needs to be as durable as possible, and made out of very strong materials. In most cases, this means a mixture of heavy-duty plastic and metal. When it comes to strong soft-sided products, look for the ones manufactured from luggage-grade nylon. The durability and sturdiness of a particular cage worthless if it’s not properly strapped. Because of this, we advise you to look for kennels that feature strong and highly durable straps. One important thing to note here is that smaller cages often allow you to attach them to your seatbelts, while the majority of larger models require the owner to have them strapped to tie downs. When it comes to pet safety market, there are almost no regulations; which means that one can’t always trust in what the manufacturer claims. For that matter, we recommend looking for models that passed crash tests, with publicly available results. The best models in this regard are those bearing a 5-star CPS certification – they will keep your four-legged friend safe and secure in case of a car accident. If one can’t really trust the claims of the manufacturers, whom he can trust? This is where the Center for Pet Safety comes into play. The goal of this non-profit organization is to provide the dog owners with independent safety testing of all sorts of pet-related products, such as crates and harnesses, among others. This is of crucial importance with little to no safety regulations in the world of pet safety equipment. CPS says that there are no test protocols or performance standards for most classes of pet-related products in the United States. They also point out that the manufacturers of these items are not required to have their products tested before selling them. All loving dog owners are bound to be shocked by this fact, especially when we consider that a dog that’s not properly secured inside the car also put humans at risk. And what’s even worse, the CPS has discovered that the most of crates actually fail to protect the pup in case of a car accident. In fact, there are only a couple of travel kennels that have been certified as safe by this organization, which is quite appalling. Even though we said that the majority of popular and affordable travel carriers usually fail the safety tests, it’s still worth noting that they do offer some help – especially when it comes to distraction prevention. Having the crate with the pooch placed on the backseat leads to a safe driving experience, and, therefore, to a lower risk of having a car accident. So, while these cheap models won’t provide your dog with sufficient protection in case of a collision, they’re still better than having no kennel at all. The same can be said for the majority of dog seat belts and dog booster car seats – they provide no protection but can prevent the pup from bothering you while you’re driving. 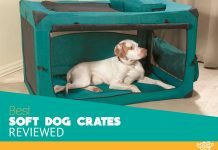 However, you should still opt for a quality crate that can keep the pooch safe and prevent distractions at the same time. CPS performs two tests. The first one is completed with the carrier being held in the car’s cargo area, with the vehicle’s backseat folded down (the carrier itself is secured via straps). This is where most of the cheap models fail. In the second test, the carrier is once again put in the same place, but this time with one side of it resting against the backseat (which is not folded down in this scenario). As you can already guess, this gives the kennel some additional support, which is precisely why a lot more models manage to pass this test. However, the main issue here is that having the kennel leaning on the backseat leads to an improved risk of seatback failure in case of a front impact collision. This puts both the dog and the passengers at risk, which is precisely why it is not recommended to use seatback support for the travel pet crate. Making sure that your canine friend is safe while traveling in the vehicle is of crucial importance if you want to avoid injuries or death in case of a collision. One can never know if he’s going to experience a car accident, which is precisely why your pooch should always travel in a quality crash-tested kennel. In our reviews, we have tried to find all the advantages and flaws of the market’s most popular dog carriers for cars and travel in general. We analyzed the features of each model and tried to determine their value for the money, with the goal of helping our readers to find the best dog car kennel for their own and their dog’s needs. G1. It sports the right combination of excellent safety features and comes at a reasonable price – what more could one want from a dog travel crate for a car?